Podgorica is the capital and largest city of Montenegro. Your inner history buff will appreciate Ostrog Monastery and Dajbabe Monastery. Escape the urban bustle at Lovcen National Park and Nature & Wildlife Tours. Step out of Podgorica to go to Virpazar and see Virpazar-old-bridge, which is approximately 1h 10 min away. The adventure continues: explore the activities along Skadar Lake National Park and take in the architecture and atmosphere at Saborni Hram Hristovog Vaskrsenja. Plan a Podgorica trip in moments using our itinerary builder. Tel Aviv, Israel to Podgorica is an approximately 10-hour flight. Due to the time zone difference, you'll gain 1 hour traveling from Tel Aviv to Podgorica. 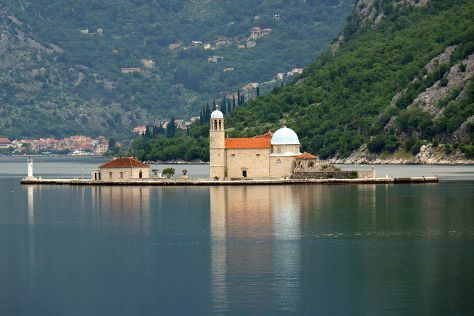 Cap off your sightseeing on the 9th (Fri) early enough to go by car to Kotor. Visit R.K.C. Gospa od Škrpjela and St. Tryphon Cathedral for their historical value. Step out of the city life by going to Bay of Kotor and River Rafting & Tubing. Change things up with a short trip to Plavi Horizonti Beach in Radovici (about 32 minutes away). On the 13th (Tue), spend a thrilling day on the water with a speed boat tour. There's much more to do: contemplate the long history of Stari Grad Kotor, get to know the fascinating history of City Walls, step into the grandiose world of Kotor’s Castle Of San Giovanni, and take a leisurely stroll along Porto Montenegro. To find ratings, where to stay, traveler tips, and more tourist information, read Kotor attractions tool . You can drive from Podgorica to Kotor in 1.5 hours. Alternatively, you can take a bus. In August, daily temperatures in Kotor can reach 38°C, while at night they dip to 20°C. Wrap up your sightseeing on the 13th (Tue) to allow time to drive to Ulcinj. Ulcinj is a town on the southern coast of Montenegro and the capital of Ulcinj Municipality. Visiting Mogren Beach and Becici Beach will get you outdoors. You'll enjoy a bit of beach vacationing at Long Beach (Velika plaza) and Ada Bojana. Venture out of the city with trips to Budva (Altstadt (Old Town) Budva, Citadela Fortress, & more), The Monastery of Rezevici (in Petrovac) and Milocher Park (in Sveti Stefan). There's more to do: take in the architecture and atmosphere at St. Nicholas' Church. To find reviews, where to stay, maps, and other tourist information, read Ulcinj trip itinerary planner . Getting from Kotor to Ulcinj by car takes about 1.5 hours. Other options: take a bus. Traveling from Kotor in August, Ulcinj is a bit warmer at night with lows of 25°C. You'll have a few hours on the 18th (Sun) to wrap things up before traveling home.